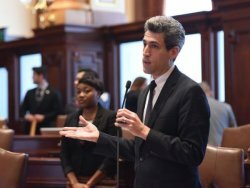 This week, Daniel Biss announced the endorsement of State Senator Omar Aquino. “I’m proud to endorse Daniel Biss for Governor of Illinois,” said Omar Aquino. “I’ve lived in Chicago all my life, so when we talk about issues like education funding and tax reform in Springfield, I know how our actions impact people’s lives. Daniel isn’t afraid to make hard choices, such as redistributing education funding more equitably, even with wealthier schools in his own district. What impresses me the most about Daniel is his dedication to amplifying voices that are typically ignored. When we’re working together, whether to raise the minimum wage, create a student loan bill of rights, or protect undocumented communities, Daniel’s integrity and persistence inspire our colleagues to stand with us. I’m always proud to have Daniel by my side in the legislature, and I’m excited to continue working with him as governor.